Can You Stand Another Sock Bunny? I was not on a fun break, but I had a little stomach bug, the kind that goes around and just didn’t feel like doing all the things it takes to get something posted. I did make a couple of things, and I will post one today and then get the other one up in a day or so. I can’t believe I was sick on Easter Sunday, the day after my birthday. No fun at all. 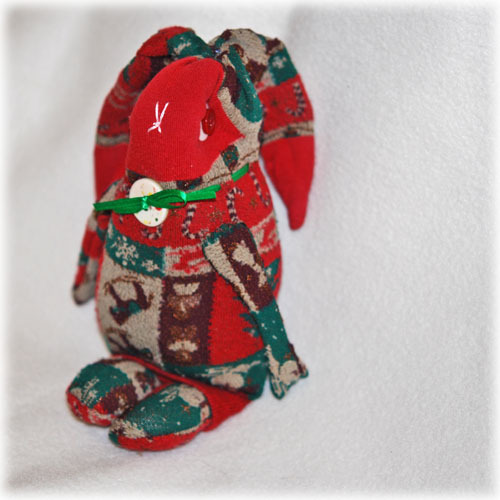 But, I’d rather talk about more fun things so, I want to share another sock bunny I just finished. I seem to be really intrigued with these little creatures, they are so easy to make and cute and they fit all my favorite criteria. They reuse something you would otherwise throw away and they don’t require any sort of real skill or pattern. This time I used a pair of patterned Christmas socks that were in good shape but I don’t wear now that we live in the land of flip flops. I wasn’t sure how it would come out, but I think he looks like he’s wearing a little Christmas sweater! I also modified the arms and legs and was really pleased with the new look. Well, I’m going to stop talking and you can go see what you think of my new and improved Standing Sock Bunny.